Love is in the air, and Valentine’s Day is right around the corner! I honestly cannot believe how fast February arrived. And as I start to think about what to get the two special Valentines in my life, I know that not any gift will do. I have to send Valentine’s Day love with Hallmark, my one stop shop for that extra special “something” for everyone on my list. 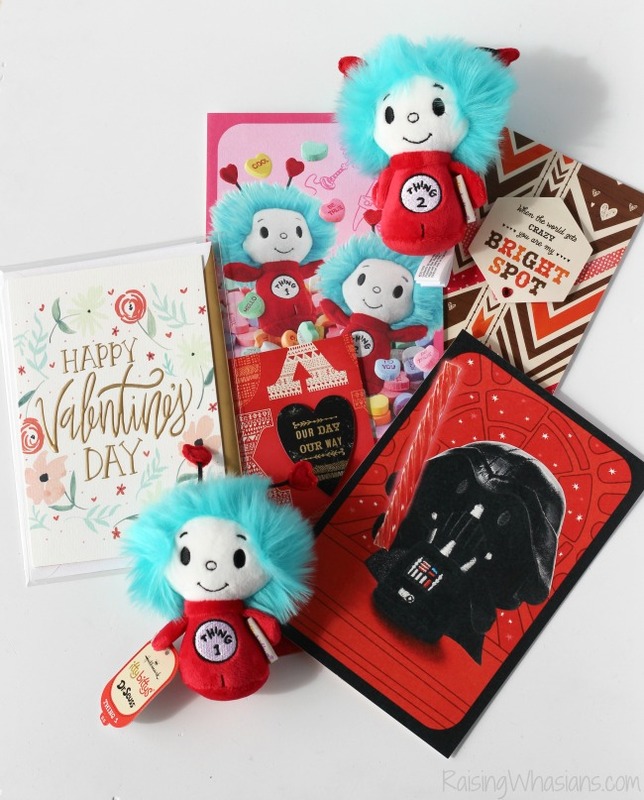 From the adorable huggable plushes to the perfect unique card, Hallmark has just what I’m looking for to say “I love you.” Check out what’s new for you and your family this Valentine’s Day and be sure to scroll down for an extra special GIVEAWAY for the season! Every holiday begins and ends with special words to say “I love you.” Hallmark is here for you with Valentine’s Day greeting cards for everyone on your list. 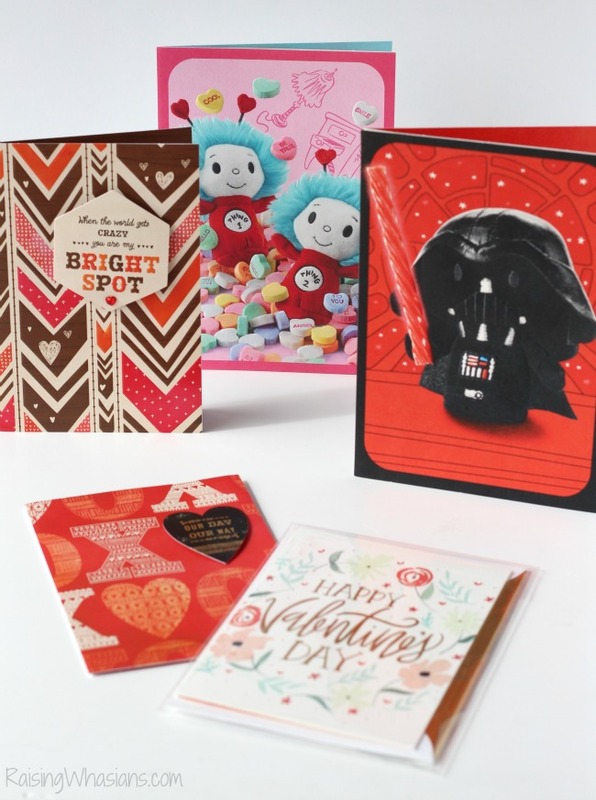 This season, Hallmark has the best selection including cards from the Signature collection, all-new itty bitty Valentines and new pop-up cards from Hallmark designers Justin & Tuesday Spray. From kids to family to friends near and far, there’s a greeting card with just the right words. Want a Valentine’s Day gift that really “roars” with love? The new Hallmark Love-a-Saurus Techno Plush brings the FUN to the holiday with big love, a bigger roar and some masterful dance moves that will help shuffle his way right into your Valentine’s heart. Press the button to watch Love-a-Saurus sing and dance to a parody of “U Can’t Touch This” by MC Hammer, and watch the smiles! Check out this video to see Love-a-Saurus in action! 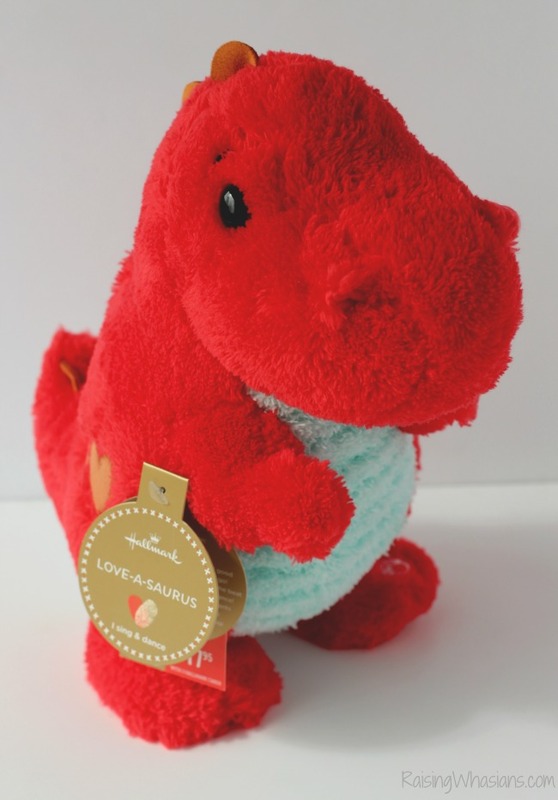 Grab your Love-a-Saurus at Hallmark, only $17.95 with the purchase of 3 Hallmark cards. 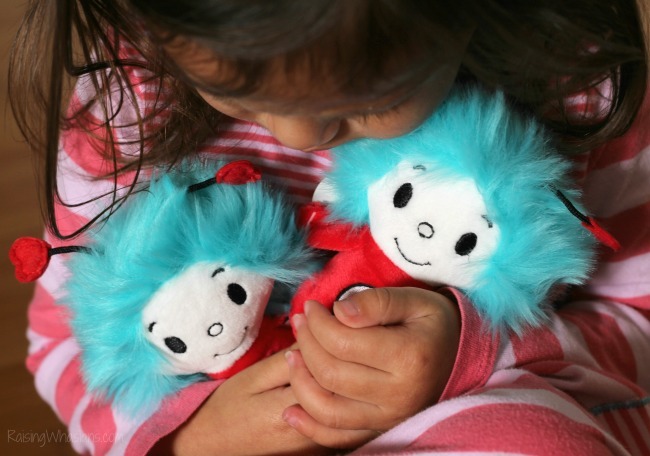 Are you a HUGE fan of Hallmark itty bittys too? 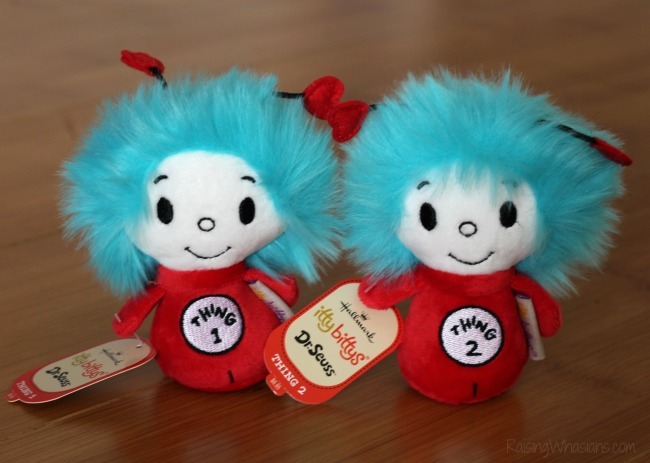 Perfect for little hands, the new Thing 1 and Thing 2 itty bittys come straight from the world of Dr. Seuss into your homes for the holiday. And how sweet are their little “hearts” for antenna? Perfect for tucking into gift baskets or for sending just a small “special something,” I just love how these itty bittys send a BIG hug to your Valentines! So if you’re wanting to send love this Valentine’s Day, be sure to head to your local Hallmark to stock up on personal gifts and cards for everyone on your list. Be sure to follow Hallmark via Facebook, Twitter, Pinterest, Instagram and YouTube for the latest products, cards and smiles! Now that you’ve entered to win a FUN Hallmark prize pack, join the Valentine’s Day giveaway fun! 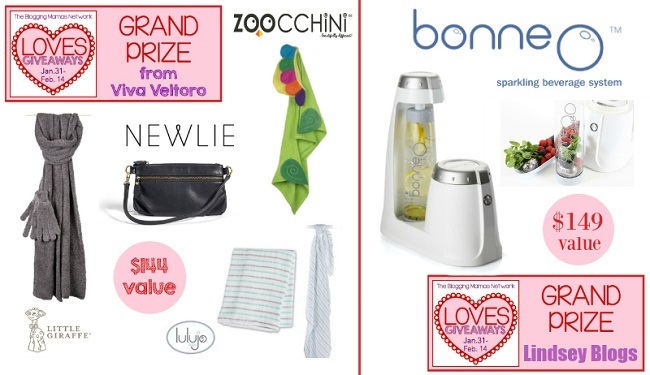 Enter BMN Loves Giveaways Hop, hosted by Lindsey Blogs and Viva Veltoro. We’re celebrating the upcoming holiday with something everyone loves… giveaways! Be sure to hop around to all the bloggers involved in the Hop, including the two Grand Prize giveaways, in the linky below! How can Hallmark help you say “I Love You” this Valentine’s Day? So Easy Being Green, Viva Veltoro, and the BMN Loves Giveaways participating bloggers are not responsible for sponsors who do not fulfill prize obligations. I love giving Hallmark gifts and cards because they always have unique items. Hallmark has terrific products, cards and collectibles that we all love and keep forever. Hallmark makes wonderful products. 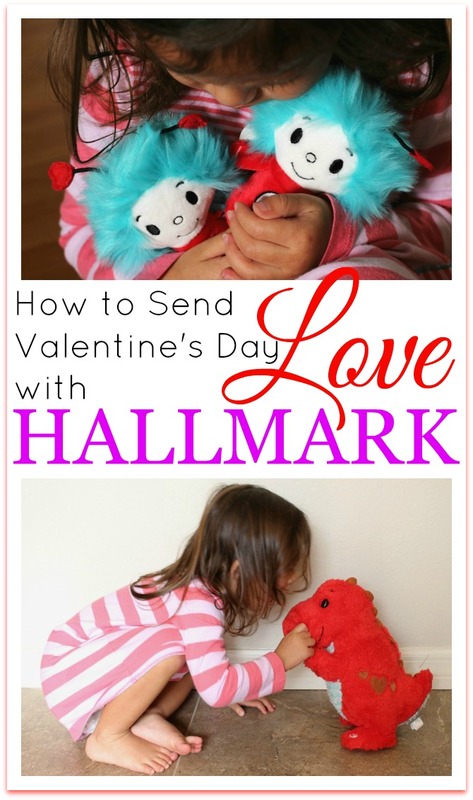 Also, who doesn’t look for the Hallmark logo when they receive a Valentine’s gift? It’s a staple of the holiday. I love Hallmark as it is a good name and has quality products. Hallmark has always represented quality, and even love, in my eyes! I love giving Hallmark products because they have a wide variety and it always makes my day to see other people light up when receiving a Hallmark card or gift. I love to give Hallmark products for Valentine’s day because they have a great selection! I am always able to find a card that says just the right thing. I like to give Hallmark products because they have characters that my kids enjoy. I love to give Hallmark products for Valentine’s Day because they are always so special and unique compared to other products. I like giving Hallmark surprises for Valentine’s Day because they have the cutest stuff!! I love their cards, stuffed animals, and gifts!! Hallmark has great selections of wonderful items. We love them. The best part of shopping Hallmark is that I can find something for everyone on my list, from my best friend to grandma to my husband. I don’t know about anyone else, but I tend to flip my greeting cards over to see who manufactured them. Hallmark is always quality! Hallmark is something special. It’s like giving or getting the best greeting cards. I love the quality of the products and the personalization. The quality is always nice and they have things other stores don’t have. I love Hallmark’s products. They have such cute greeting cards for every holiday. Hallmark products are always the best of the best. Such quality and tradition. Hallmark gifts allows you to make your gifts more personable! I love giving Hallmark gifts and cards because they have such well made items and cards that everyone loves. hallmark offers a variety of unique and special gifts for every occasion that’s why I love shopping there. I love Hallmark products because I grew up with the slogan when you care enough to send the very best you send Hallmark. I love to give Hallmark cards and gifts to my family! I can count on the quality of their products. Because Hallmark is always perfect. Great quality and things I just love to give. They always have sweet unique sayings. Hallmark is the best. They have quality gifts and beautifully written cards. This Valentine’s Day the have this singing pig that is hysterical. I like to give Hallmark items because they are always good quality and just cute things that can become family traditions. I like Hallmark products because they always have the right thing at the right time. Hallmark has always had the best selection and the highest quality. Hallmark just always has the cutest sweetest products in their lines, perfect for your sweet Valentine. Hallmark really does show that you care. It is not just a tag line saying they are the very best, because they are the very best. My son would love the Love-a-saurus! He gets a kick out of the Hallmark dancing animals! I love the quality and tradition of doing so. I love giving Hallmark gifts because they are collectible and timeless. It’s something my children will have to remember me by when I am gone. Happy memories. I love giving Hallmark products because they are always so cute. I love giving Hallmark on Valentines Day because there are so many different items to pick from and they cover all different ages!! Everyone is happy!! We love Hallmark because their cards are great quality and thyme really stepped up their designs lately. I love that I can walk into their store and know I’ll find the perfect card every time. I love the quality of Hallmark products as well as I always find a card I really like, & I can’t say that at other stores. They send a heart-felt message to loved ones. I like Hallmark because they have gifts for everyone and every occasion. I love giving Hallmark products because I know I am always going to get a quality product. i like to give hallmark cards because they are high quality and they are always so nice and creative. I love Halmark because their products are so creative. I like to give them because they are great products & there is something for everyone. I love the Itty Bittys I would give them to my kids. Hallmark always has such cute items for all holidays, from stuffed animals, to ornaments, to greeting cards and so much more, I can find something for everyone! Hallmark always has such beautiful cards to choose from! Hallmark products make a memorable gift. I think it is nice to buy cards and gifts at Hallmark for Valentine’s Day so that your friends and family know they are appreciated. I think it is the little things you do that stick out in someone’s mind. I love Hallmark products! They are so cute and great quality (and they have awesome sales). I remember going to Hallmark when I was old enough to walk to the shopping center down from our home. Ever since then I have loved Hallmark gifts! Hallmark products are always great quality, original and fun! How stinking cute! I love to give Hallmark gifts because they are all so meaningful and sweet. They are always items that you will value and cherish! I love shopping at Hallmark for the Holidays for they always have something inspirational to give as a gift. They have such a good selection and a variety of items. I like to give Hallmark products because they’re high-quality and show real sentiment. Thanks. I buy hallmark cards for almost every occasion because the sentiments inside feel more heartfelt than a lot of the other more generic cards. I love giving Hallmark products for v-day b/c they have something for everyone. I love Hallmark because I know I am getting quality products that my family will love. I like that the products are cute and sweet and the kids go crazy for them. Hallmark quality is just amazing!! And they have the cutest stuff ever!! I love to give them to my kids! Hallmark produces quality products, so you know the gift will be appreciated. Hallmark makes great seasonal products so I’m always happy to give them. I love Hallmark because I can always find personal gifts. I love getting or giving Hallmark items because they are always so personal and great quality. I love Hallmark. They sell quality products and cards. I love what they stand for also; a great company. Hallmark has always made great gifts and lasting memories! Thank you! I feel that I can always find a quality item at the Hallmark store. Hallmark has some of the cutest, most clever products. I love giving Hallmark items to friends and family. I have been buying Hallmark’s cards for many, many years. They are beautifully designed and the sentiments are lovely. I love their online personalized, musical cards for my family and friends. Their gifts, recordable books and Keepsake ornaments are fantastic! I love hallmark because it knows how to put into perfect words what I want to say to the ones I love! I love to give Hallmark products to my kids because it’s something they can keep forever! I love the verses on the cards and especially love pictures of dogs. I like their designs and their verses in the Hallmark cards. My 6 year-old daughter would love these! I love giving Hallmark products to my husband, mom, dad, sister, nephews, kids, friends. I love giving (and receiving) Hallmark because they make a consistently good quality product. We haven’t been let down yet. I love that I can trust that Hallmark gifts are always great quality. 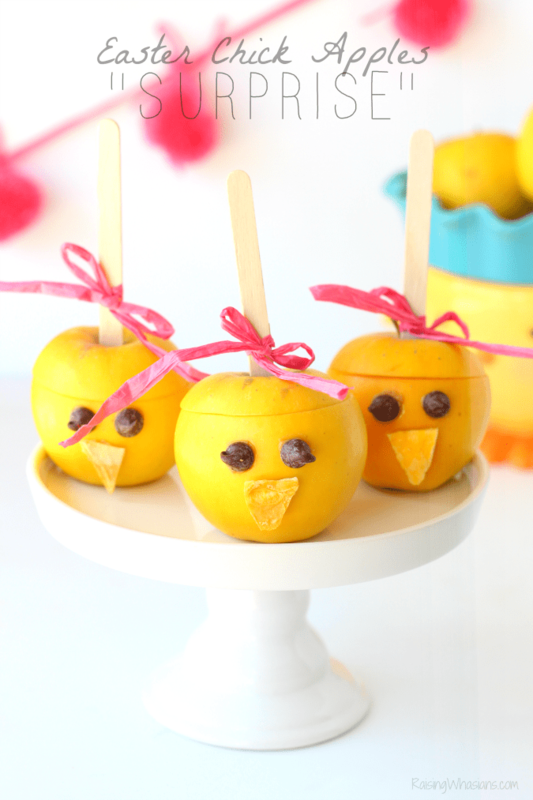 Plus their items are usually so cute and easily allow you to express emotions associated with any holiday! The quality is always fantastic and there is such a fun variety to choose from! I love Hallmark! They always have the cutest gifts no matter what the holiday! Hallmark always offers super cute options for all ages! I don’t know of anyone that doesn’t like Hallmark! They have some of the best cards and sentimental ideas for all the holidays! I love their collections. Like the Christmas ornaments collection. Hallmark products are always well made and really good gifts to give. I like them because the sentiments expressed by them are usually just what I want to say to those I love! Hallmark is the gold standard especially for Valentine’s day. They have a great selection of products to say what you really want to say. I think they have the best cards! I love to give Hallmarks because they have cute, high quality cards. I can always count on Hallmark products to be high quality and adorable! They have really cute and adorable cards and gifts. I like to give them to dd and hubby! Hallmark has great sayings on their cards. I love to give HAllmark goodies for ALL holidays! They have great quality products that are cute, durable and fun to choose from for my family. I love Hallmark because they make a great variety of quality products. Hallmark cards always have the perfect sayings in them. They’ve got a great variety of high quality products! Their products are just so sweet. I just remember Hallmark for years and years.. I love all the products in their store. I love them because they are so cute & unique. I love Hallmark quality. They have a catergory for everyone and you can pick easy to fit your relationship. My daughter has been my Valentine for the last few years…I love that I can purchase something that will remain a keepsake for her! Plus they have a lot of Snoopy items and we collect all things Snoopy! I love Hallmark because they have a wide selection of products that could express my emotions so much better than me. I love Hallmark because they have quality products to fit the personalities of everyone in my family. They are great keepsakes! I like giving hallmark gifts to my kids. I love to give Hallmark gifts because they have so many super cute items. Their Christmas ornaments are awesome. I bought my husband the new Star Trek itty bittys for Valentine’s Day. I am obsessed with itty bittys too! because they are a cut above the rest there products have been around forever and are beautiful. I love to give Hallmark at Valentine’s day and anytime because they have the best selection and quality! I love to give Hallmark products because I know it will be the best quality. because they have some of the best quality of stuff to choose from. I like to give Hallmark productss because I know that they are unique and of high quality. I can usually always find something to fit each person’s personality. Hallmark makes the best cards! I love Hallmark cards because they are so high quality. I love the quality of cards and gifts available at Hallmark. I give Hallmark because they are such geat quality. Hallmark gifts are special.. It shows that time was taken to pick out something thoughtful. I love going there because they always seem to have that perfect little gift! that and the Quality is always great, they never let me down no matter what I get! !